When I was working on the book, I pulled together a reference collection of boots of various sorts. Some of these were found on the far-flung reaches of Ebay or Etsy. Others came from the darkest recesses of our closet. This pair is one of the latter. They look like the sort of thing that might have been worn by a sixties dolly bird, but they actually date from 1996. As I’ve mentioned in previous posts, in Britain the middle years of the nineteen nineties saw a huge resurgence of interest in the music, art, and fashions of the sixties. These were the years of “Britpop,” a distinctive guitar-driven form of rock with psychedelic overtones typified by bands like Blur, Oasis, Suede, Pulp, and a host of lesser imitators. Where sixties pastiches are found, there also the fashion boot flourishes. The iconic look of a miniskirt and boots is a potent one, even if most of the evidence suggests that the look was nowhere near as common as movies like Austin Powers would have you suppose. Boots had already made a comeback as part of the clubbing culture of early nineties Britain, but now shoe retailers went full tilt into sixties-themed nostalgia. And nothing says sixties like a pair of white boots. 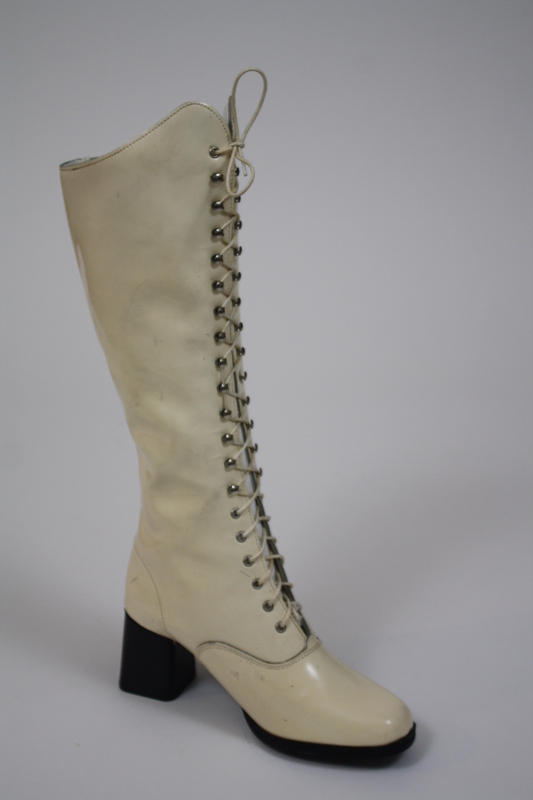 Stack-heeled lace-up boots had been hugely popular a couple of years previously; this pair by the British store Dolcis took the stack heeled design, reworked it in white patent leather, and added that elegant Edwardian-style curve to the top of the shaft. An instant winner, right? Unfortunately not. The tall lace-up boots of the nineties had a circulation-challengingly tight fit which did wonders for the line of the wearer’s leg, but they also took forever to get on, which is one reason why they were rapidly supplanted by zip-fastened designs. And however keen you were on sixties fashions, a shiny white pair was never a practical option in grimy British cities. That explains why these particular boots ended up in a bargain bucket at Dolcis, where I purchased them for the princely sum of £5:00. I bore them home in triumph to my wife who, being much more knowledgable about fashion than me, cocked a quizzical eyebrow and consigned them immediately to the farthest reaches of the closet. Where they remained for almost twenty years, until I needed a pair of boots to illustrate a piece on sixties nostalgia for the book.